Heat a little oil in a pan and place the chicken fillets in one even layer on a high flame. Sprinkle over taco seasoning and salt on one side then flip the chicken over and sprinkle some more on the other side to taste (I used about 1 heaping tsp of taco seasoning in total for the chicken). Once the chicken is a little charred on both sides take it out of the pan and let it rest for a few minutes before cutting it into thin strips. In the same pan stir fry the sliced bell peppers for a couple of minutes and turn off the heat. In a small bowl mix the cream, half the salsa, 1/2 tsp taco seasoning and a pinch of salt together. Then take a 13×9 in baking dish and lightly grease it so the tortillas don’t stick. Now it’s all about making an assembly line. Start filling each tortilla with some chicken, bell peppers and a tsp of salsa, roll it up and place it into the dish. Make sure you evenly split the chicken and bell peppers between each tortilla. 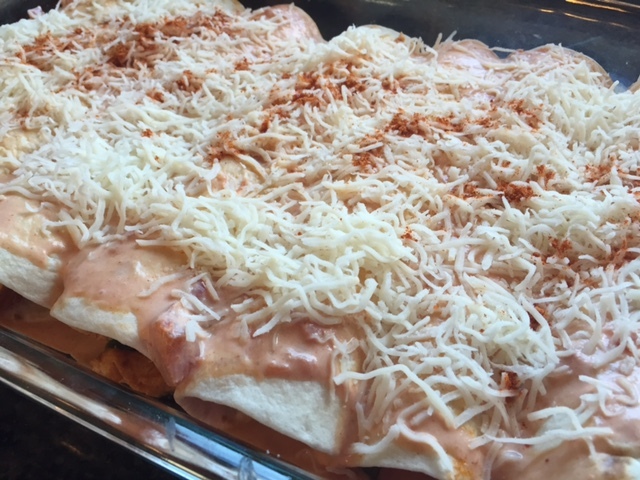 Once your dish is full of rolled up tortillas pour over the cream and salsa mixture and sprinkle the shredded cheese on top. Bake in a 380 F oven for about 25 minutes or till the cheese is a light golden color and the sauce is bubbling. 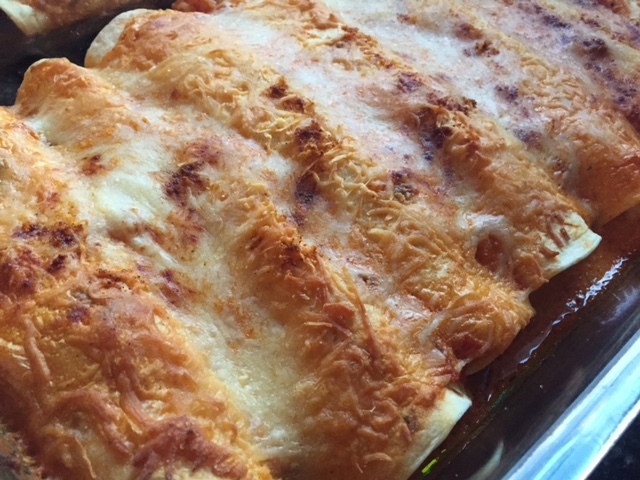 Serve with refried beans, guacamole or mexican rice. It’s delicious on it’s own as well!